This evening we come together to honor and pay tribute to Sister Margaret Jilka: aunt, cousin, friend and Community member to all of us. Sister Margaret’s interesting life began on Feb. 17, 1930, as the youngest of five children to Jerome and Agnes Wearing Jilka. She was given the name of Margaret Mary. The family house was on the east edge of Salina, Kan. Today, we would call it at an acreage for they had a cow and other animals, chickens and ducks and a large garden. In our present time it is an area filled with beautiful homes and curvy streets south of Marymount and the cemeteries. were happy. As a teenager in high school she wrote in her life story that those years were happy but difficult. other girl came to live with the Jilka family. She was an orphan girl who was with the family through high school and college until her marriage. as a Sister of St. Joseph. A turning point in her life came at Cure of Ars, in Leawood Kan., where she had the courage to ask for a different grade level and was given grade four. After a year and a half she was transferred to Our Lady of Perpetual Help in Concordia, and finished the semester with grade six. the wide open spaces in which to walk, think and pray. nor Wearing, a resident at Mount Joseph, to her place for a vacation. workshop on journaling with Ira Progoff. theology with a thesis on a portion of Thomas Merton’s writings. in pastoral care at St. John’s Hospital. This worked out well. Her mother passed in 1990. It was not unusual to see a dog accompanying her on these walks. love for all of creation much like she quoted Thomas Merton on Solitude. deepens our union with God and with one another. 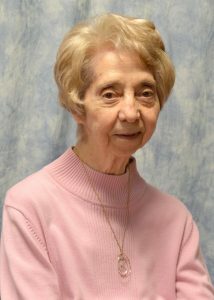 Memorials for Sister Margaret Jilka may be given to the Sisters of St. Joseph Health Care/ Retirement Fund or the Apostolic Works of the Sisters; P.O Box 279, Concordia, KS 66901. We are here to celebrate the life of a woman of goodwill, good humor and a host of good relationships with family, community, and friends far and near. When Sister Christella asked me to give her eulogy she requested that it be short and humorous. As for short, she then handed me a 10-page, single-spaced story of her life to use. As for humor, I can recall many instances when she used her name to make people laugh. Once when speaking at a drug and alcohol dependency meeting over at St. Joseph’s Hospital she began her talk by telling the participants that they would not always be alcoholics but that she would always be a Buser! She was indeed a Buser. Eleanor Maurine was born July 29, 1924 in Seneca, Kan., to George and Mary Elizabeth Karnowski Buser. She had six brothers, George, Alfred, Eugene, John, Donald and Burton (Bud). Her sisters were Mary Beth and Judith. She had a warm and happy childhood. Her parents provided well for the family and taught them to live full and productive lives. 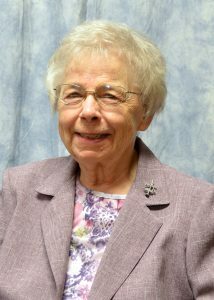 She received her elementary and high school education from the Benedictine sisters who staffed the parish school in Seneca. After graduation from high school, she thought of going to Marymount College. The idea came to her when two sisters from Marymount, Mary Grace Waring and Euphrasia Barth, came to Seneca to recruit students for the college. Her college years at Marymount were filled with serious study while earning a degree in music education and with many happy hours of the usual antics and social life with friends she made at school and with whom she maintained life-long contact. After graduation she decided to enter the Sisters of St. Joseph in Concordia. She had a cousin here, Sister Margaret Ann Buser, and she was also greatly influenced by the lives of the sisters as she observed them at Marymount. 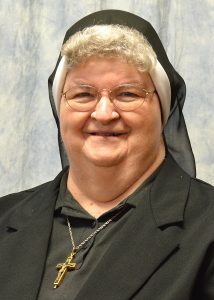 She received the habit and the name Christella on March 19, 1947, made first vows in 1948 and final vows in 1951. She was excited to get her first mission assignment to Tipton, Kan., to teach music and give private lessons. After five years in Tipton, she taught music at the parochial school in Concordia and then was asked to open a school to be staffed by our sisters in Leawood, Kan., the new Cure of Ars School where she would be the superior and music teacher. During this time through summer sessions she earned a MA in Music from DePaul University in Chicago. Christella’s music ministry ended with election to the Executive Council in 1965. As vice president for President Therese Marie Stafford she saw many changes begin to take shape in religious life after Vatican Council II. 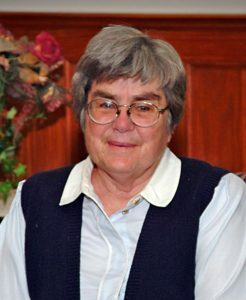 She worked with the community in accepting the changes and was very compassionate with those who decided to leave religious life during the years that followed. She bore the burden of Sister Therese Marie’s illness and death in 1969 and assumed the office of president at her death. 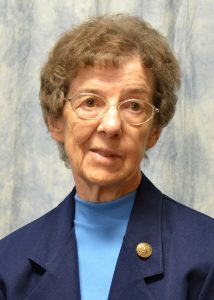 During her term as President she encouraged sisters to explore new ways of praying and offered opportunities for 30-day and eight-day directed retreats. 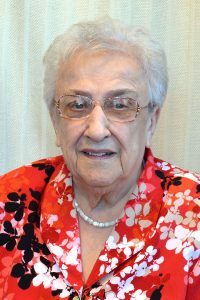 With her council she experienced the need for changes in the corporate structure of the hospitals owned and operated by the Sisters of St. Joseph. These institutions, along with Marymount College, were undergoing many changes. And at the end of her term these challenges were handed on to her successor, Sister Bette Moslander. Christella enjoyed many close relationships during her years as president. She and Sister Edwardine Flavin, general treasurer, worked together on financial matters. But they also enjoyed many humorous moments together. Like the time they went to a wedding at the church and then proceeded to the parish hall for the reception. They saw a nice table near the entrance with flowers and long-stem glasses. They decided that would be a nice place to sit. Along came a woman who humbly asked them to move as they were at the table reserved for the bride and groom. Looking back on her accomplishments Christella said with her characteristic self-deprecation that she increased the size of the cemetery and replaced the old barn with a nice six-car garage. Furthermore, it means developing our own freedom and richness in order to “become more ready to reach out to our neighbors as well as to other sisters. This is our way to live out the call to self-sacrificing love.” Radical change was a way of life in the early 1970s. She made sure that all of it was surrounded by and founded in deep prayer and personal sacrifice, not only for herself and the council but within the individual members and local communities. All were consistently called to prayer. The members underwent total lifestyle changes and the congregation itself adapted to the new world ushered in by the cultural revolution of the 1960s. Every part of the system changed, every department was transformed; the governance structure was redesigned; she paid off loans made for building new hospitals, separately incorporated institutions, disposed of three hospitals owned by local civic communities and bought into Social Security. Through it all she encouraged sisters to tighten their belts and to enter into deep prayer. Loss of members meant loss of income and school closures, fewer sisters to operate the hospitals and other institutions. From the struggle to create a House of Prayer to setting up a retirement fund for elderly and ill members, from visits to the Brazilian mission to all the decisions required to almost instantly modernize religious life, Christella was in the thick of it, encouraging and holding the community together with her ready humor and compassionate care for each person, her belief in the mission and the sisters who lived it. With her leadership, individual sisters and local communities branched out in response to local and national world needs. It was a time of intense growth and as all such times require, the chaos of change and experimentation was managed and used as seed for the coming days. And, in spare moments she visited the sick and buried the dead, increased the institutional capacity to care for the sick and elderly and enlarged the cemetery; purchased dozens of new cars and transformed the barn into a garage. From L’Arche ministry she once again spent time as Communications Director for the community. However, she was a people person; direct contact was important for her, so once again she looked around and found a new way of being with others. She created a new ministry called the “Joy of Laughter” with the goal of getting people to enjoy laughter and find positive meaning in their lives. She was invited to present her program to over 100 different groups and continued this ministry as long as she was able. Christella’s life review attests to her life direction — loving, lover, beloved. Love was the central theme of her life. She was intensely sensitive and wore her heart on her sleeve. Easily hurt and distressed by injustice she responded with compassion. We members of her community — and as Michael spoke – you members of her family – all of us were deeply loved by Christella. She said that the people of the L’Arche community stole her heart, but it was taken long before by the many who moved her heart from earliest years. She was a people person and a courageous lover, ready to accompany those whom she judged to be outside the pale, forgive them and move on. She was fun-loving, enjoyed humor, tolerated gladly the stories we told on her, often misunderstood, but formed by suffering into the compassionate presence we all knew and trusted. Christella, you now experience fully this love. Thank you for all the many ways you shared it with us over your 94 years. Eulogy: Written by Janet Lander, CSJ, and presented by Eulalia Kloeker, CSJ. Tonight, we celebrate the life of Sister Veronica Ann Baxa. We offer our sympathy to her family: her siblings, their spouses, her nieces and nephews, great-nieces and great-nephews and extended family. 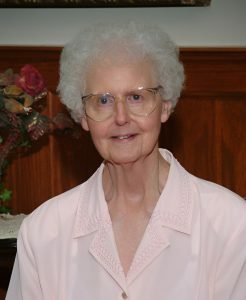 We also offer our sympathy to her friends, the nursing staff who helped care for her, the Motherhouse community with whom she lived, her Circle of community life, and in a special way her band members: Sisters Beth Stover, Betty Maschka and Rita Plante. 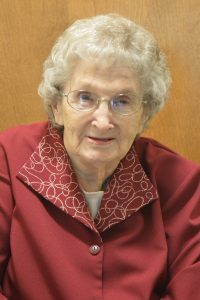 Sister Veronica Ann Baxa was born in St. Joseph’s Hospital, Concordia, Kan., on Nov. 12, 1941, to Fred and Lottie (Oborny) Baxa, and given the name Veronica Ann Baxa. She grew up on a farm near Cuba, Kan. Veronica was the oldest child. Her younger siblings are: Fred Baxa, Larry Baxa, Ella (Baxa) Rudolph, Marvine (Baxa) Orbony and Marian Baxa. The youngest brother died in a car accident, but the others are living and here among us. Veronica was baptized at St. Isadore’s Church in Cuba, when she was 11 days old. Veronica recounted that her father had wanted a daughter who would become a Sister, and even gave Veronica a “Sister doll,” so her thoughts of becoming a Sister started early in life. She first met the Sisters of St. Joseph in vacation school at St. Isadore’s, and when she was in sixth grade she announced at a family meal that she wanted to be a Sister. The next year, Sister Josephine Loretta Geis encouraged her to go to the Apostolic School at Nazareth Convent in Concordia for high school. 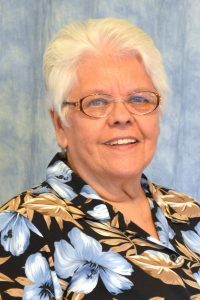 After completing elementary school in a country school called Prairie Home near Cuba, Veronica attended high school at the Apostolic School for four years, graduating May 15, 1959. Veronica entered the Sisters of St. Joseph of Concordia on Sept 8, 1959. On March 18, 1960, she was received into the novitiate and given the name Sister Mary Lawrence which she had requested, as these were the middle names of her parents. She made first vows March 19, 1961, and final vows March 19, 1966. During the year 1961-62, she assisted Sister Mary Julia Stegeman in the laundry at Marymount College, and took some courses. The next three years she worked at St. Joseph’s Children’s Home in Salina, Kan., doing housekeeping and helping first and second graders with homework. From 1988-90 Veronica Ann lived in Clyde, Kan., ministering in social service and pastoral visiting at Park Villa Nursing Home. She also visited the elderly in the parish. During this time she became a CNA (certified nursing assistant). During the summer of 1989 she greatly enjoyed a sabbatical course in Erie, Pann., for Sisters of St. Joseph. 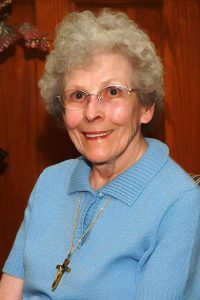 In 1990 Veronica moved to Minneapolis, Kan., and began working at the Good Samaritan Center Nursing Home in the inventory control department, ordering all the supplies needed for care of the residents. She was self-taught on the computer when this technology became necessary for her work, because, as she says, “You have to keep learning to keep up with the times.” She found working with the elderly to be a rewarding ministry, especially praying at the bedside of dying residents. She was also very active in Immaculate Conception parish, as a Eucharistic Minister, member of the Council of Catholic Women, singing in the choir and serving as the Catholic Register correspondent for the parish. Reflecting on these years of living and ministering on her own, she says, “I learned to be responsible for many things, including taking care of the car … Some of our Sisters who are my friends … hear me say, “I have come a long way baby.” She also said that living alone blessed her with more time to spend in prayer. Yes, thank you Jesus for your call and loving fidelity to Veronica. And thank you, Veronica, for your ‘yes,’ and the myriad of ways you have cared for us your community and your family. May Jesus now welcome you home.